For more than 80 years, the American Academy of Pediatrics has been the nation's leading and most trusted child health authority. 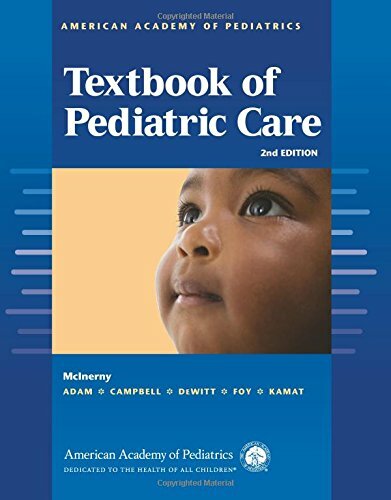 The new second edition of AAP Textbook of Pediatric Care continues the tradition by providing a wealth of expert guidance spanning every aspect of current clinical practice. When you purchase the AAP Textbook of Pediatric Care, 2nd Edition print copy, you also receive FREE eBook access! Gain a better understanding of the relationship between mental and physiologic health and between early childhood adversity and long-term health outcomes. Effectively integrate mental health care into routine primary pediatric care: mental health screening, surveillance, promotion, symptoms, and conditions are now fully integrated through the text. Expertly apply the latest approaches and techniques with 75 new chapters, including Planned Coordinated Care to Support the Medical Home; Pediatric History: Assessing the Social Environment; Promoting the Health of Young Children; Applying Behavior Change Science; Conducting the Health Supervision Visit; Psychosocial Therapies; Transitions to Adulthood; Children in Poverty; Maternal Depression; Disruptive Behavior and Aggression; and more. Diagnose, treat, and manage 85 of the most common physiologic and behavioral signs and symptoms more effectively. Thomas K. McInerny, MD, FAAP has been a primary care pediatrician in private practice in Rochester, NY for 40 years and is Professor and Associate Chair for Clinical Affairs in the Department of Pediatrics at the University of Rochester Medical Center. He is a graduate of Dartmouth College and Harvard Medical School and did his pediatric residency training at Cincinnati Children s Hospital and Boston Children s Hospital. He has held many elected and appointed positions in the AAP since 1987 including President of Chapter I, District II, Member and chair of the Pediatric Research in the Office Setting Steering Committee, Member and Chair of the Chapter Forum Committee, Member and Chair of the Committee on Child Health Financing, and the Steering Committee on Quality Improvement and Management. He also was a member of the Task Force on Mental Health which developed the AAP Mental Health Toolkit. He is a member of the American Pediatric Society and the Academic Pediatric Association and a Certified Physician Executive and Fellow of the American College of Physician Executives. In 2011 he was elected President of the AAP, and he served from 2012 to 2013. Henry M. Adam, MD, FAAP: Until recently, Dr. Henry M. Adam was a Professor of Clinical Pediatrics at the Albert Einstein College of Medicine in the Bronx, NY. After graduating Phi Beta Kappa from Hamilton College and studying as a Woodrow Wilson Foundation Fellow at Yale University, he graduated from the State University of NY-Upstate Medical Center in 1979, where he was elected to the Alpha Omega Alpha Honor Medical Society. Following pediatric residency training at Mount Sinai Medical Center in NYC, he was a Fellow in general and behavioral pediatrics and then joined the faculty at Einstein. He has directed the Pediatric Outreach Program (1984-86), the AIDS Day Care Center (1987-90), and the Pediatric AIDS Primary Care Program (1990-94), all at Jacobi Medical Center. As an educator, Dr. Adam directed the pediatric residency training program at Montefiore Medical Center (1994-2002), has received the Lewis Fraad Teaching Award, and has been elected to the Leo Davidoff Teaching Society. Deborah E. Campbell, MD, FAAP, is Professor of Clinical Pediatrics and Associate Professor of Clinical Obstetrics & Gynecology and Women s Health at Albert Einstein College of Medicine, Program Director for the fellowship in Neonatal-Perinatal Medicine, and Director of the Division of Neonatology at the Children s Hospital at Montefiore. She conducts the Low birth weight infant Evaluation and Assessment Program (LEAP) and has served various leadership roles at the American Academy of Pediatrics, New York State Association of Regional Perinatal Programs and Networks, NYC Local Early Intervention Coordinating Council, and Greater New York March of Dimes Health Professionals Advisory Board and National March of Dimes. She is a member of the Greater New York Hospital Association Perinatal Safety Collaborative Advisory Group, the National Quality Forum Perinatal Collaborative, and the New York State Perinatal Quality Collaborative Neonatology Expert Workgroup. She also serves on the NYS Palliative Care Education and Training Council, an expert panel that has developed guidance and advice for the New York State Department of Health on best practices in pain management and end-of-life care. She served as a member on the AAP Taskforce on Implementation of Newborn Hearing Screening and the Early Hearing Detection and Intervention (EHDI) Program. She is currently co-chair of the Bright Futures Guidelines, 4th edition Infancy Expert Panel. This is a tremendous resource for providers caring for pediatric patients. It is what one would hope and expect from the American Academy of Pediatrics: a trusted, relevant, comprehensive, well-organized book that serves as an essential and invaluable resource for practicing providers. McInerny, Thomas K., M.D./ Adam, Henry M., M.D./ Campbell, Deborah E., M.D.